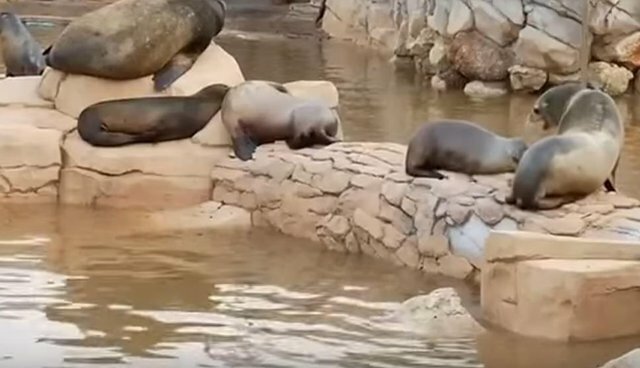 The torrential floods on the French Riviera late Saturday have not only proved deadly for scores of people - emerging images show captive animals at a marine park in Antibes, France, are under siege from the recent floods as well. Pictures and video over the weekend show holding facilities at Marineland Antibes fill with muddy, contaminated water. The polluted water rushed into the sea park - one of the largest in Europe - and has caused the death of stingrays and sharks. The onslaught has also displaced other animals, according to a statement by Born Free U.K. Two endangered loggerhead turtles have disappeared. A third turtle was found this morning in the dolphin's infiltration system, writes the organization. "Attention is now focused on saving the orca and dolphins that are reported to have survived the flooding, but concerns have been raised about adverse effects on the tank's filtration system," adds the group. Reports indicate that there is still no electricity, no filtration system and few staff to help with the evacuation and rescue efforts, although efforts to reach the park by The Dodo were not immediately responded to. However, the director of Marineland, Bernard Giampaolo, is quoted as saying: " There have been some losses, but our killer whales are not dying on the parking lot as some people are saying here and there." Samantha Goddard, Born Free's spokesperson, said in the statement: "Animal attractions, such as Marineland Antibes, must be able to demonstrate a viable rescue plan before receiving an operating licence. It is inconceivable that such a facility, responsible for so many animals, has no apparent contingency plan."